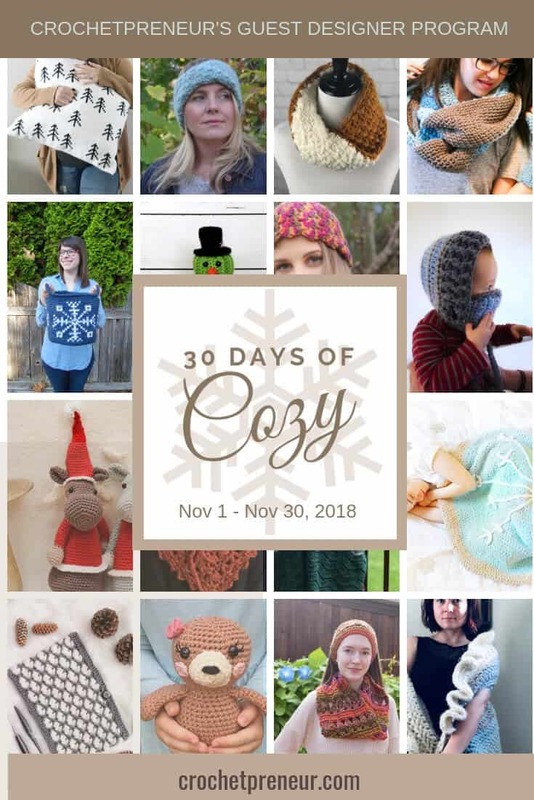 Introducing the 30 Days of Cozy Guest Designer Program! For the entire month of November, we’ll be bringing you the hottest, trendiest designs of Winter 2018/19 from some of our favorite up-and-coming crochet designers. Each designer was handpicked from a pool of over 100 applicants and invited to create a unique design just for you this holiday season. The patterns were gathered together under one umbrella….30 Days of Cozy. Each day, throughout the month of November, one brand new pattern will be released for FREE right here on the Crochetpreneuer blog so be sure to come back often and see what’s new. 1.4 GET YOUR 30 DAYS OF COZY BUNDLE & DOWNLOAD TODAY! I hope you’re as excited for these designs as we were in designing them for you! And, as a special offer, we’ve gathered all of these patterns (many of them upgraded to premium patterns with additional sizing, photo tutorials, and embellishments), and create the 30 Days of Cozy pattern bundle that you can purchase for 90% off and download today! *Note: this is a digital bundle of downloadable patterns. You will not receive anything in the mail. There is no printed material. GET YOUR 30 DAYS OF COZY BUNDLE & DOWNLOAD TODAY!